Because the analytical solutions to coupled and generalized thermoelasticity problems are mathematically complicated, the numerical methods, such as the finite and the boundary element methods, have become powerful means of analysis. This chapter presents a new treatment of the finite and the boundary element methods for this class of problems. The finite element method based on the Galerkin technique is employed in order to model the general form of the coupled equations, and the application is then expanded to the two- and one-dimensional cases. The generalized thermoelasticity problems for a functionally graded layer, a thick sphere, a disk, and a beam are discussed using the Galerkin finite element technique. To show the strong rate of convergence of the Galerkin-based finite element, a problem for a radially symmetric loaded disk with three types of shape functions, linear, quadratic, and cubic, is solved. It is shown that the linear solution rapidly converges to that of the cubic solution. When the temperature change compared to the reference temperature may not be ignored, the heat conduction becomes nonlinear. The problem of thermally nonlinear generalized thermoelasticity of a layer based on the Lord–Shulman model is presented in this section, and it is indicated that how and when this assumption is essential to be used. 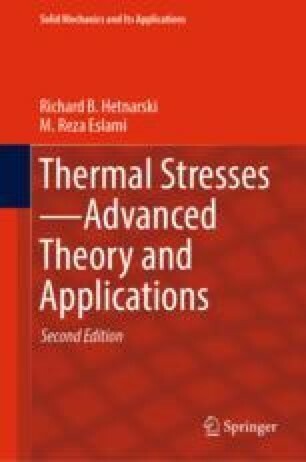 The chapter concludes with the boundary element formulation for the generalized thermoelasticity. A unique principal solution satisfying both the thermoelasticity and the coupled energy equations is employed to obtain the boundary element formulation.